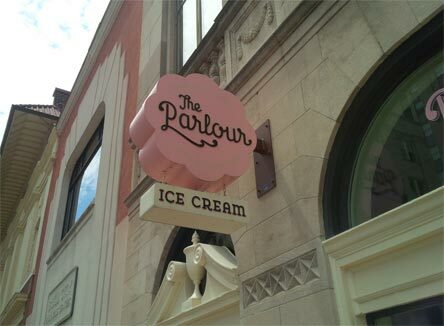 [By Nick] On our way back North, we took a detour and stopped at The Parlour in Durham, NC. 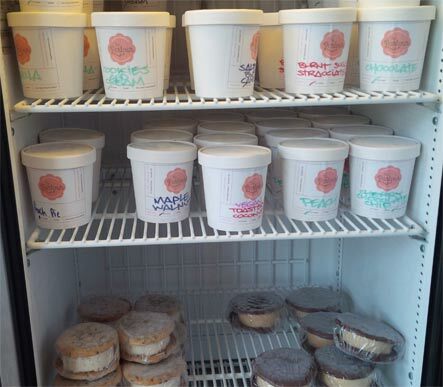 ‎They came onto my radar from the Thrillist 33 Best Ice Cream Shops in the country (Leopold's is also on the list). There's no way I could pass up the opportunity to check this shop out. Upon arrival, we met with the owners and got a tour of the shop and their kitchen. Their kitchen is easily the biggest I've seen from a scoop shop and they have tons of room to expand production of ice cream or do just about anything else with that room. Funny thing is, they started selling ice cream from a bus before they got this shop. It's amazing to see how fast this shop has grown in such a short period of time. After the tour, Yoni, one of their owners, gave us a ‎sampling of a bunch of their flavors. We started things off on the highest of notes with my two favorite flavors from the shop. Their Salted Butter Caramel and Vietnamese Coffee. 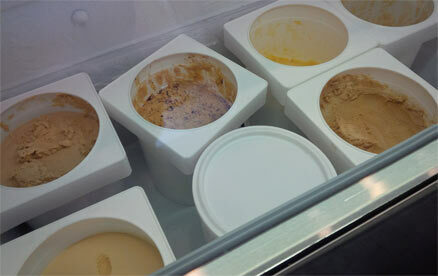 The former was hands down the best salted caramel ice cream I have ever had. Rich, buttery, salty and just amazing. Perfect seems like not even close to a good enough word to describe it. The Vietnamese Coffee is no slouch either. Possibly the best coffee base I have ever encountered in my life. The condensed milk makes it sweet without overpowering the coffee flavor. Seriously, I could be happy living life being able to only eat these two flavor. Next up, he had us try a flavor that I can't remember the name of and can't find mention of it online. All I know is that it's a sauce for Greek food that isn't tzatziki. It was way too weird for me though. It was slightly lemony and the rest I can't even describe. He also gave us another weird flavor with their Mango Chile. This one tastes good in the beginning being just like a fresh mango. However, the chile kicks in after a second and it's far too strong for my liking. 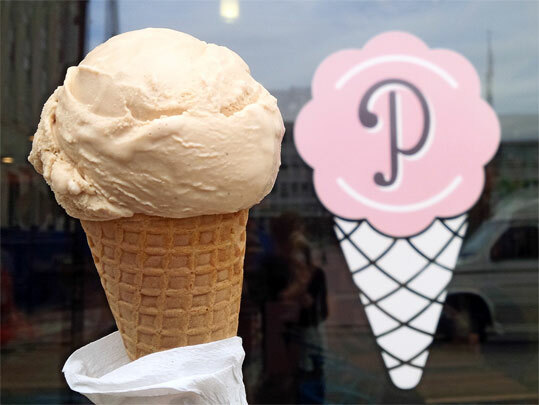 We went into something more traditional with their Peach Pie ice cream. This one tastes like fresh peaches with a hint of vanilla and some pie crust crumbles thrown in. I wouldn't mind a pint of this one at all. After that, we tried their standard Vanilla and Chocolate offerings. Honestly, they're nothing too special and I feel that they are only there for those who aren't in to trying things too far out of their comfort zone. He then gave us a sampling of their two vegan flavors. The chocolate has a lot of chocolate incorporated to drown out the coconut milk flavor which is a good thing for those like me that are iffy with coconut. There was also a toasted coconut flavor that I was fine with not trying but my girlfriend made me try it anyway. I wasn't a fan, there was just far too much shredded coconut for my liking. She enjoyed it though so there's that. That finished the sampling but I was eyeing their sundae menu the whole time. The Drunken Sailor needed to be consumed. 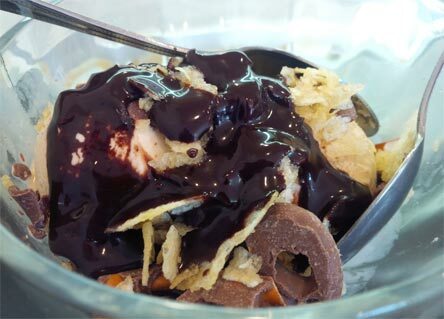 I mean, it uses their amazing Salted Butter Caramel ice cream, adds potato chips, chocolate covered pretzels, and finishes things up with a chocolate sauce drizzle. It might not be pretty to look at but oh man was it delicious. The salt level may have been a tad bit much though. I'd recommend using chocolate covered potato chips instead to temper things. Still, it was worth it even if I needed a drink of water after. The Vietnamese Coffee was still on my mind though so we got ourselves a scoop of that to go and then we were on our way. This shop deserves all the hype it gets and I know if I find myself anywhere near them again, I'll be stopping by.